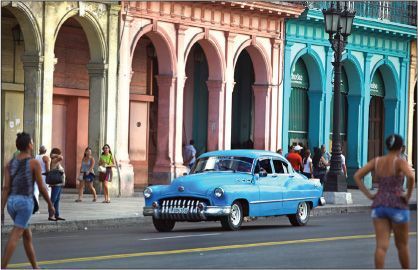 A circa-1950 Buick cruises downtown Havana. At Cuba’s National Museum of Fine Arts, the paintings are “as good as anything you’ll find at the Museum of Modern Art in New York.” Even more eye-opening, though, was Museo de la Revolución, which offers a strongly anti-American account of post-1950 Cuban history. Visiting Ernest Hemingway’s former home the next day was more fun. The house, Finca Vigia, is open on all sides, with animal skins on the floors and the great writer’s Royal typewriter sitting on a desk like a holy relic. Rain interrupted our stroll on the grounds, so we ran to a tent where an Afro-Cuban jazz band was playing, and joined a dancing crowd while young women handed us Havana Club rums. It was barely noon. Through Cuba Visa Services (cubavisaservices.com), tourist visa cards cost $85 each.